Public expectations are up with the release of First Script Reading stills from the casts of a brand new KBS2 Autumn Melodrama "Nice Guy" (차칸남자). 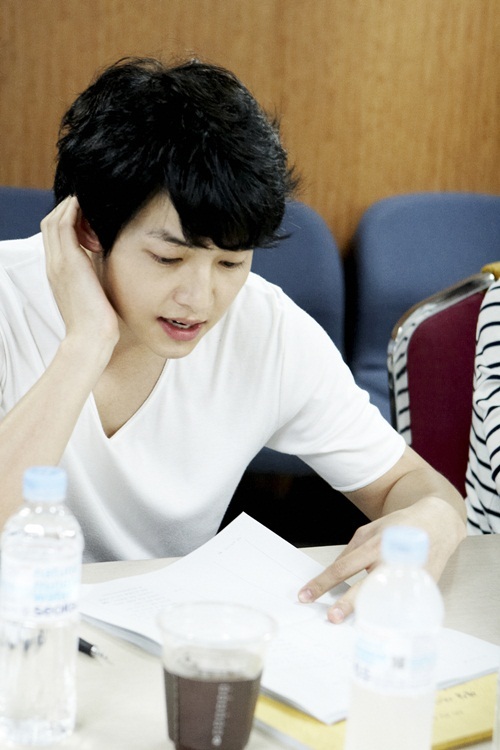 Director Kim Jin Won and scriptwriter Lee Kyung Hee, lead actors Song Joong Ki, Moon Chae Won and Park Si Yeon as well as some supporting actors such as Lee Kwang Soo were present for the first script reading which was held on July 5, 2012. The spokesperson mentioned that all actors were serious and passionate, that it felt like they were actually filming the drama. Lee Kwang Soo comedic acting brightened up the atmosphere and the script reading ended satisfactory without a hitch. The storyline pretty simple: Kang Maru (Song Joong Ji) who was betrayed by his girlfriend Han Jae Hee (Park Si Yeon) to achieve personal ambition. He plans his revenge to get back at her by using an amnesiac woman Seo Eun Ki (Moon Chae Won). Lee Kwang Soo will play as Jae Gil (Maru's best friend) and I'm looking forward to their collaboration as I love both of them in Running Man. Lee Yu Bi will play as Choco (Maru's sister). Nice Guy will be broadcast on KBS2 after Bridal Mask finishes.